FOUND by domestic bliss: NEW GOODS & VINTAGE JEWELRY in TODAY! NEW GOODS & VINTAGE JEWELRY in TODAY! WAXING POETIC...such a versatile gift.. for the classic MOM, or the FUNKY graduate, this line can't be beat- Just received a HUGE shipment so we are sure to have a great assortment of initials! AND...Just in time for MOM's Day... Beautiful Jewelry from DOS FANNIES made of vintage finds and Antique baubles. 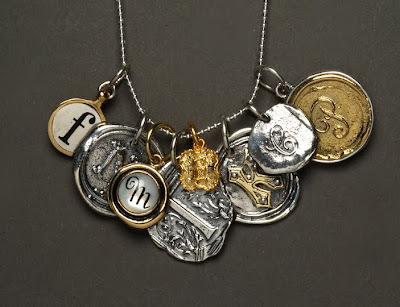 Every piece has a story~ LOVE it all! Have a wonderful Mother's Day weekend & Be GOOD to those MOMS! These are great!! I am crazy for monograms!! Aw geez! You KNOW I'll be wearing one of these on Wednesday! They're soooo cool!